In 1921, Paul Spotts Emrick had an idea – a very, very big idea. He wanted his Purdue University Marching Band to have a bass drum larger than any drum found in any other band anywhere in the world. The band director envisioned a drum that would be taller than the man who played it, a drum that would get Purdue fans excited. He wanted a drum that would bring attention to the band and the university from all over the world. There was only one problem. No one had ever made such a drum. The biggest drum of the day was about four feet in diameter, and Emrick wanted one at least twice that size. In 1921, drum makers didn’t have synthetic materials available to them and drumheads were still made from animal hides. To make a huge drum, you had to find huge hides. A lot of people shook their heads at Emrick’s wild idea, but the Leedy Corporation of Indianapolis – who advertised themselves as the largest drum factory in the world – took him very seriously. 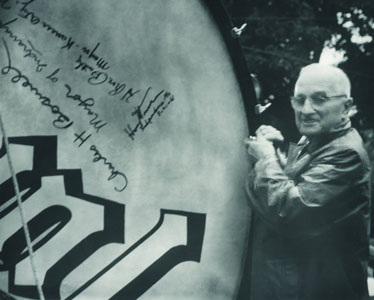 Ulysses Leedy recognized the publicity value involved in making this drum for Purdue and was determined to make it happen. Leedy searched around the world for huge animals to make the drumheads. He finally found the a steer large enough in Argentina. The Drum’s shell is made of solid maple, and its metal parts are chrome-plated. Although the Drum is now painted old gold and covered with silver diamonds, it originally boasted a polished wood exterior. The finished Drum weighs about 300 pounds. Combined with the weight of its carriage, it totals over 550 pounds. The Drum was completed in June 1921 at a cost of nearly one thousand dollars. To pay for it, the band performed a concert that raised $500. Elks BPO Lodge 143 donated the remaining funds necessary. To announced the Drum’s completion, Leedy called the press who took both still and moving pictures. Movies of the Drum were shown at the Circle Theater in Indianapolis during the week of Aug. 14, 1921. Amidst much hoopla, the Drum was displayed at the Indiana Statehouse, then exhibited at the Indiana State Fair for a week. Finally, it was delivered to Purdue and began its long career with the band. Throughout the Midwest, it was an immediate sensation. When it was played for a football game at the University of Chicago, the fans went wild. As soon as the game ended, the University of Chicago asked the Conn Company to build them a similar drum. 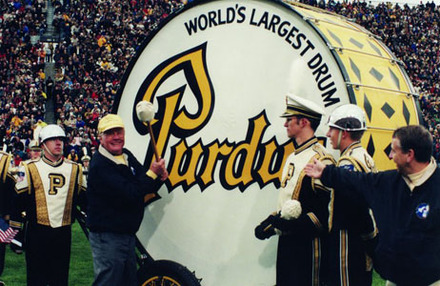 Conn managed to produce “Big Bertha,” but they were never able to prove that it was larger than Purdue's Drum. When the University of Chicago dropped its football program, Big Bertha was sold to the University of Texas at Austin, where it remains to this day. 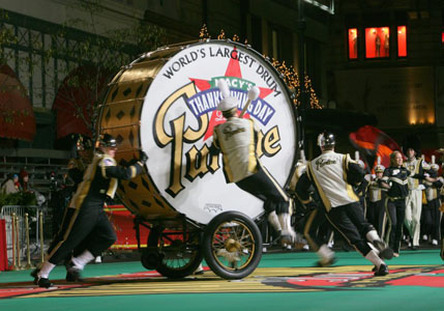 Having a big drum created traveling challenges for the Purdue Band. In the early days, the band traveled mostly by train. Since the doors of most baggage cars at the time were not large enough for the Drum to squeeze through, Emrick worked with the New York Central Railway to find train cars that could accommodate its size. Nowadays, the Drum travels in the back of a pick-up truck. But the biggest challenge was finding replacement drumheads when the aging heads began to crack – and paying for them. During World War II, there were so many more important things to worry about, that the Drum (and its cracked heads) were put into storage. For long periods of time between 1940 and 1954, the World's Largest Drum™ sat, unused, in storage. When Al G. Wright became Director of Bands in 1954, the first thing he did was ship the Drum off to Leedy for repair. But finding replacement heads was still nearly impossible. Wright worked with DuPont Research Laboratories in Wilmington, Delaware to find a way to create artificial drumheads. DuPont had just invented a new plastic known as Mylar, and Wright hoped that it could be used to solve his problem. A Purdue alumnus who worked for DuPont at the time took a special interest in Wright's dilemma. On his own time, the employee worked to create large, thin sheets of Mylar that could function as giant drumheads for the Drum. He was successful. For the first time in decades, the Drum took its place at the center of the Purdue “All-American” Marching Band on the football field – an enormous symbol of Purdue pride. Every year, fans marvel at the crew of band members who sprint with it across the field and perform tricks with it. Besides performing with the band, the Drum sounds off every time a touchdown is scored, and its crew does push-ups in the south endzone of the football field. Over the years, the Drum has been on all sorts of adventures and has even been “drum-napped” by pranksters including students from Purdue’s arch-rival, Indiana University. But it’s too large to stay hidden for long, and has always returned to its rightful home in West Lafayette. It’s a tradition to invite famous people to hit the Drum and sign its heads. Among the people who have had this honor are astronauts Gus Grissom and Neil Armstrong, former United States President Harry Truman, and the Kodo Drummers of Japan. 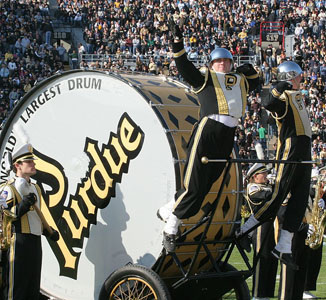 Since that time, the exact measurements of Purdue's Drum have been kept secret to preserve the mystique surrounding it. Now that drumheads can be made synthetically (thanks to Purdue and DuPont), other big drums are beginning to pop up, but challenges to Purdue’s title of “World’s Largest” are rare. Many of the same problems that existed in the 1920s still exist today. Big drums are expensive. They are awkward, hard to house, and hard to transport due to their size. 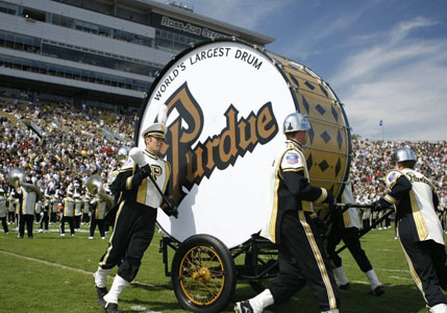 But even if someone were to build a bigger drum, Purdue's Drum will always hold a special spot in music history because Purdue’s was the very first big bass drum--and that’s a fact no one disputes.